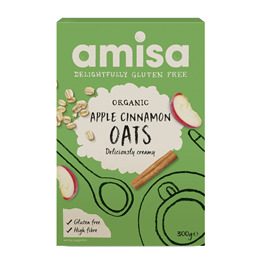 Amisa Organic Apple & Cinnamon Porridge Oats are a great way to start your day. Creamy pure oat flakes and diced apples dusted with cinnamon spice - a pure and simple pleasure. Oats are rich in fibre, so should be introduced into your diet slowly. Oats may have originated in the Fertile Crescent (also known as the cradle of civilization) in the near East. Domesticated oats were grown in Bronze Age Europe as they tolerate the cool, wetter summers. Wholegrain Oats* (89.5%), Apples* (10%), Cinnamon* (0.5%). Put 50g in a saucepan, pour in 350ml of milk or water (or a mixture of the two) and sprinkle in a pinch of salt. Bring to the boil and simmer for 4-5 minutes, stirring from time to time. For microwave: mix the oats, milk or water and a pinch of salt in a large microwave-proof bowl, then microwave on high for 3 minutes, stirring halfway through. Leave to stand for 2 minutes before eating. Serve sweetened with some honey or agave syrup. 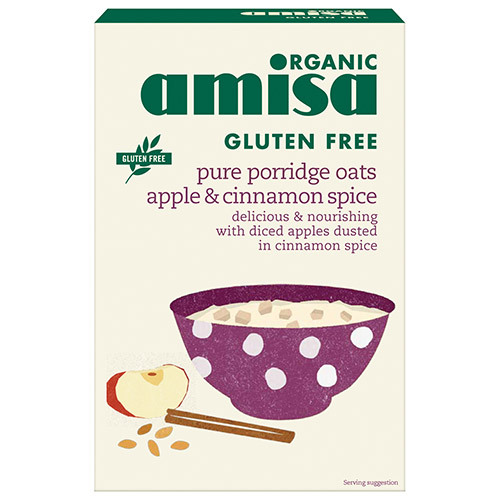 Below are reviews of Amisa Organic Porridge Oats - Apple & Cinnamon - 300g by bodykind customers. If you have tried this product we'd love to hear what you think so please leave a review.